Petting a Chihuahua in Chinatown, DC by Eric Spiegel licensed under Creative Commons. DC resident Jeff Speck co-wrote Suburban Nation: The Rise of Sprawl and the Decline of the American Dream, the best-selling book about city planning since Jane Jacobs, and Walkable City: How Downtown Can Save America, One Step at a Time. Greater Greater Washington is pleased to present two excerpts from his highly-anticipated followup, Walkable City Rules: 101 Steps to Making Better Places. Below is an excerpt from the book. There are powerful community reasons to invest in walkability. Any planner who has spent time surveying a range of communities can tell you the difference between more traditional walkable neighborhoods and automotive sprawl: In walkable places, it is impossible to spend more than a few minutes sneaking around without being approached by an inquisitive resident. In a modern suburbia of cul-de-sacs and garage-fronted snout-houses, a planner can measure streets all day and not elicit a single interaction. Where nobody walks, nobody supervises the public realm, and nobody gets to know their neighbors. It is only when we are outside of vehicles, and relatively safe from them, that the bonds of community can form. When we walk we are called pedestrians, and when we drive we are called motorists. Based on the way these two characters behave, it is hard to believe that the same people can be both of them, or even that they belong to the same species. Most pedestrians are by nature ready to engage others, or at least to acknowledge them in some way. Even looking away from another person as you pass is a form of acknowledgement, a behavior caused specifically by the other’s presence. Our paths on the sidewalk are a subtle dance of communication and accommodation. In contrast, most motorists are profoundly antisocial, and often even sociopathic. We are at our most selfish while driving, and often at our most aggressive. Only behind the wheel do we see Sunday school teachers and church deacons flipping each other the bird. Why is this? The answer is no mystery. To be a motorist is to pilot a private space in deadly competition with other private spaces. Every other motorist on the road has only two roles: competing for asphalt, and endangering your life. Because you are in competition, you are adversaries. Because they might, with one mistake, kill you (and perhaps your entire family), you are enemies. It is only when we are outside of vehicles, and relatively safe from them, that the bonds of community can form. This point was probably best made by Donald Appleyard’s now classic book, Livable Streets, which compiled his research in San Francisco about the relationship between social capital and traffic.27 Comparing streets that were essentially identical but for the number of cars they carried, Appleyard found that most people living on light-traffic streets considered their entire street to be their “home territory,” while most people on heavy-traffic streets only felt at home within their own buildings or apartments. More remarkably, while people on light-traveled streets counted on average 3.0 friends, people on busy streets averaged only 0.9 friends. 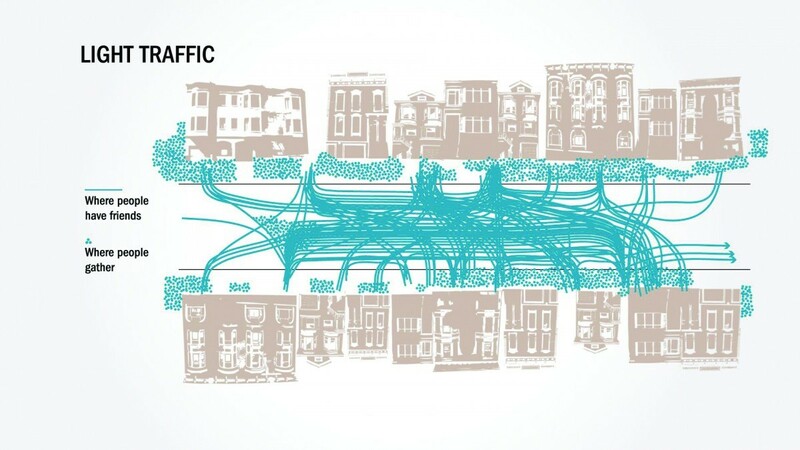 Rule 5: When advocating for walkability, don’t forget the compelling data surrounding its impact on social capital. 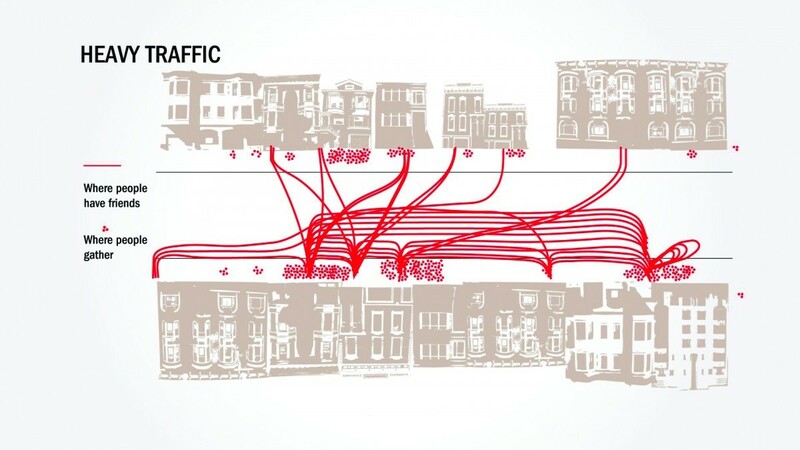 In Livable Streets, Donald Appleyard illustrated how care traffic impedes the formation of social capital. 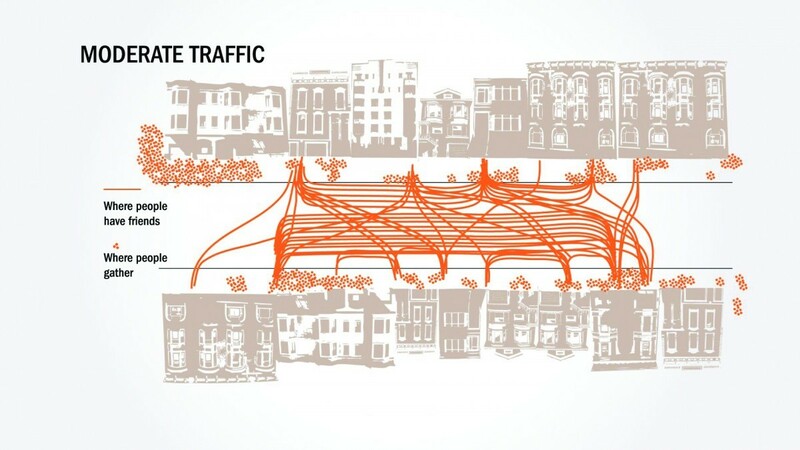 Photo Credit: Livable Streets, Donald Appleyard and Bruce Appleyard, Elsevier, 2019. 27 Donald Appleyard, M. Sue Gerson, and Mark Lintell, Livable Streets (Berkeley: University of California Press, 1981). 28 Howard Frumkin, Urban Sprawl and Public Health, 172. Also, Robert D. Putnam, Bowling Alone: The Collapse and Revival of American Community (New York: Simon & Schuster, 2000). 29 Shannon H. Rogers et al., “Examining Walkability and Social Capital as Indicators of Quality of Life at the Municipal and Neighborhood Scales,” Journal of Applied Research in Quality of Life 6, no. 2 (2011): 2013. Speck's book is out now, and you can order it from Island Press. Speck will be giving a talk and book signing at the National Building Museum on Friday, November 2 and at Politics and Prose at Union Market on Saturday, November 3. Jeff Speck is a city planner who, through writing, public service, and built work, advocates internationally for smart growth and sustainable design. As Director of Design at the National Endowment for the Arts from 2003 through 2007, Mr. Speck oversaw the Mayors’ Institute on City Design, and created the Governors’ Institute on Community Design. Mr. Speck spent the prior 10 years as Director of Town Planning at Duany Plater-Zyberk and Co., and currently leads a boutique design consultancy based in Boston.